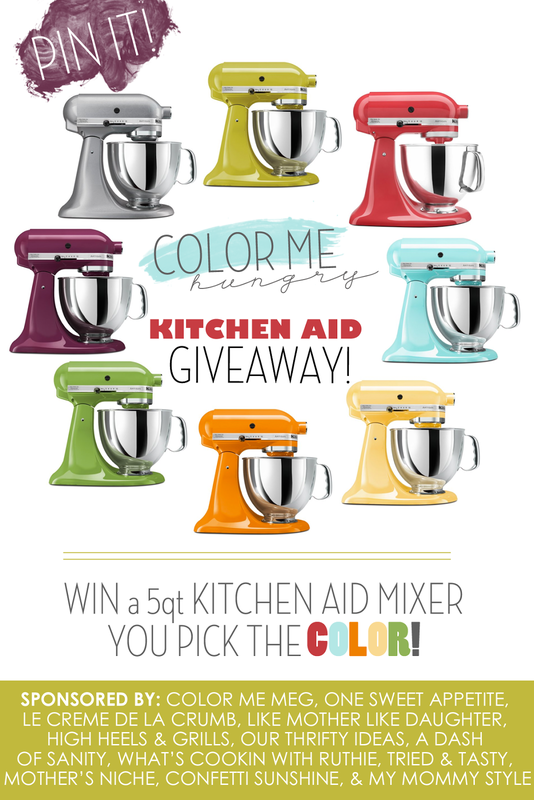 Strawberry Banana Bread and Kitchen Aid Giveaway ! Coat 2- 9x5 bread pans with cooking spray, set aside. Place butter in small sauce pan, stirring constantly over medium high heat until turns light brown and has a nutty aroma, set aside to cool. In a small mixing bowl combine flour, baking soda, and salt; mix and set aside. In a large mixing bowl combine sugar, applesauce, and eggs; mix well. Drizzle in browned butter while mixing. Add dry ingredients and mix to 80% incorporated. Add mashed bananas and lemon. Gently stir in strawberries with wooden spoon. Divide batter between pans, sprinkle with raw sugar. Bake 55-60 minutes or until inserted toothpick removes clean. Cool 10 minutes, turn out of pans, cook on rack. NOW for the really fun part!! I’m thrilled to be part of Color Me Meg launch party… such a cute space and full of fun ideas! You’ll want to visit her, check out her new look, and keep checking back cuz she has a ton of fun celebrations going on this whole entire week!! Come check out some of the other awesome bloggers by clicking on their logo above! This recipie does not specify how much sugar… any help? ?